During the 19th century growing nationalist sentiment led to a rejection of Austro-Hungarian culture in favour of that of the native Czech people. One outcome from this movement was a Nationalistic pack of playing cards painted by Emanuel Neumann in which the standard national suit symbols are replaced with non-standard ones having particular meaning to the Czech people. 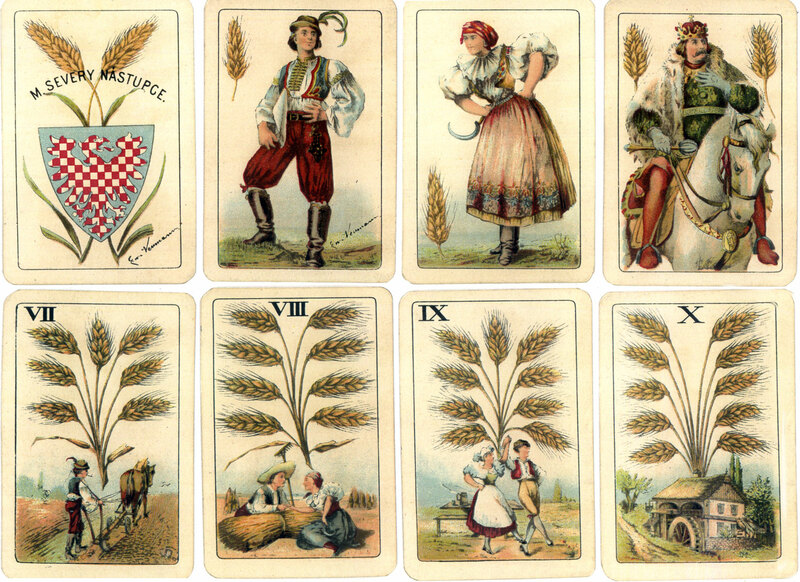 Ears of corn, or Sheaves, replace Acorns symbolising the fertility of agriculture and the Czech lands. Deep red Garnets, which replace Hearts, have reputed healing powers. 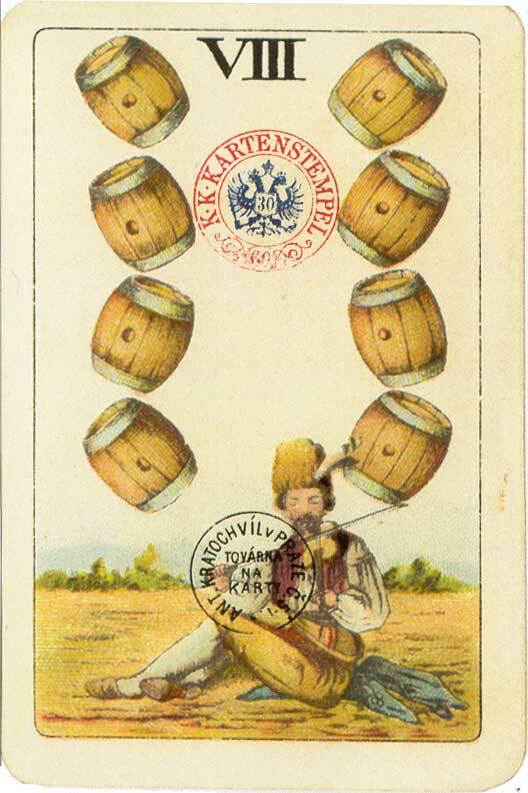 Wine Kegs replace bells to celebrate viniculture in Bohemia and Moravia that was started by the Romans. Lime Leaves are from the national tree of the Czech lands. 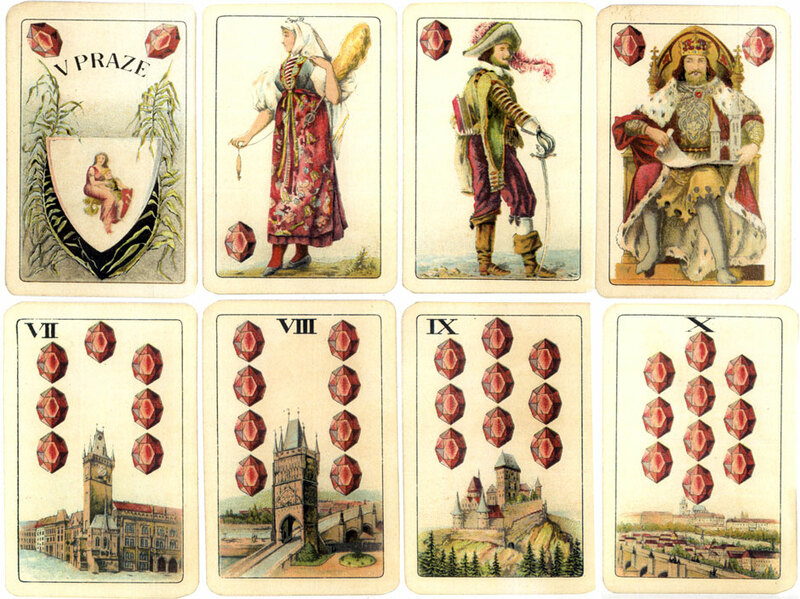 The cards were made in an effort to raise national self-confidence and esteem. The suit of Ears of Corn features workers in the fields ploughing, harvesting and celebrating. 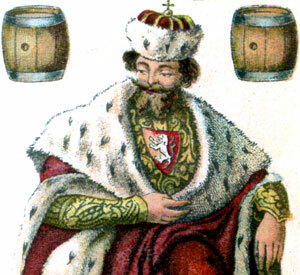 The Upper Jack shows a man in traditional Moravian dress, and the King is George of Podebrad, the last King of an independent Bohemia. The signature of the artist who painted the cards, Emanuel Neumann (1873-1932), can be seen on the Upper Jack and the daus (2) which also shows the Moravian eagle on a shield. Manufactured by Ant. Kratochvíl, Prague. The suit of Garnets features Charles IV as the King, "Father of the Nation". The lower Jack is a female weaver. whilst the VIII of garnets shows the old town bridge. The daus card (2) depicts a mother and child, symbolising maternity and the founding of the nation, with an inscription which means 'In Prague'. The suit of Wine Barrels features the Silesian eagle on the daus while the Lower jack shows a woman in traditional Bohemian dress. 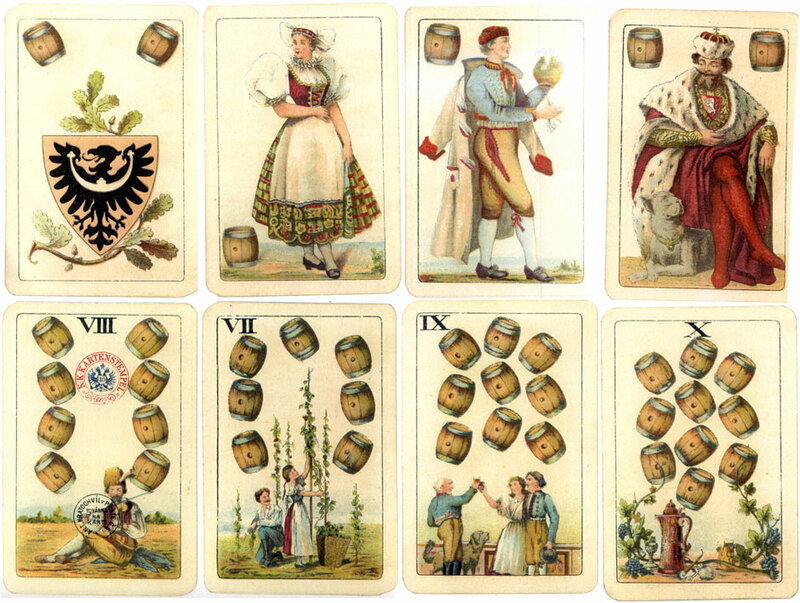 The numeral cards show scenes such as vineyards and people toasting. The VIII has the Austro-Hungarian tax stamp along with the maker's stamp. 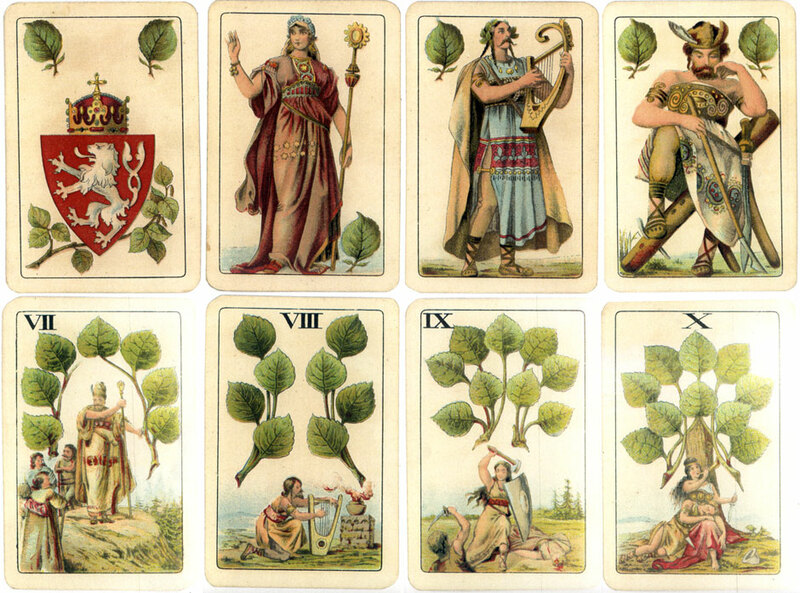 The suit of Lime Leaves features scenes from Czech history and mythology. The King is the farmer Premsyl who married Queen Libussa who is shown as the Lower Jack. The IX shows a scene from the legend of Sharka. On the daus card (2) we see the heraldic Czech two-tailed lion. Šťáhlavsky, Zdenĕk: "A 19th Century Czech Nationalistic Pack by Emanuel Neumann", The Playing-Card vol.32 no.6, May-June 2004, IPCS, England. • See also: 1908 Prague Jubilee Exhibition • 'Jugendstil' designed by Artuš Scheiner, 1920 • Ritter & Cie "Art Deco", 1933 • Eagle Playing Card Co., Ltd.